I think rhubarb is somewhat like zucchini. That is when the rhubarb is ready to pick and use it seems like there is so much that you cannot possibly use it all, the same way with zucchini. Even though each year we tell our neighbors to take rhubarb when it is ready to pick we still have rhubarb coming out of our ears. With all this rhubarb I have been searching the web for some rhubarb recipes to make for my family. A couple of the kids are not too fond of rhubarb, so I decided to look for something that would combine another fruit with the rhubarb, such as strawberries. I had never made anything with strawberries and rhubarb together; I had just looked at recipes for it. 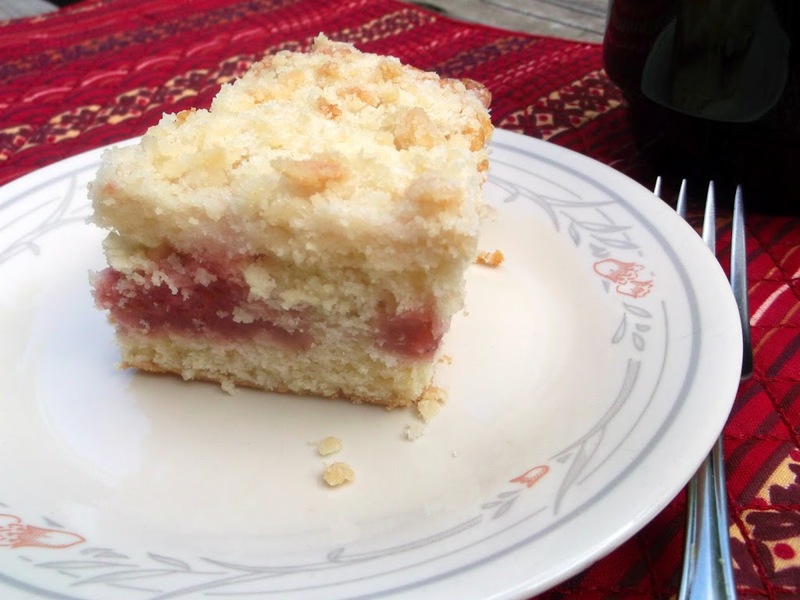 When I stumbled onto a recipe for strawberry rhubarb coffee cake, I knew that this would be one to try. 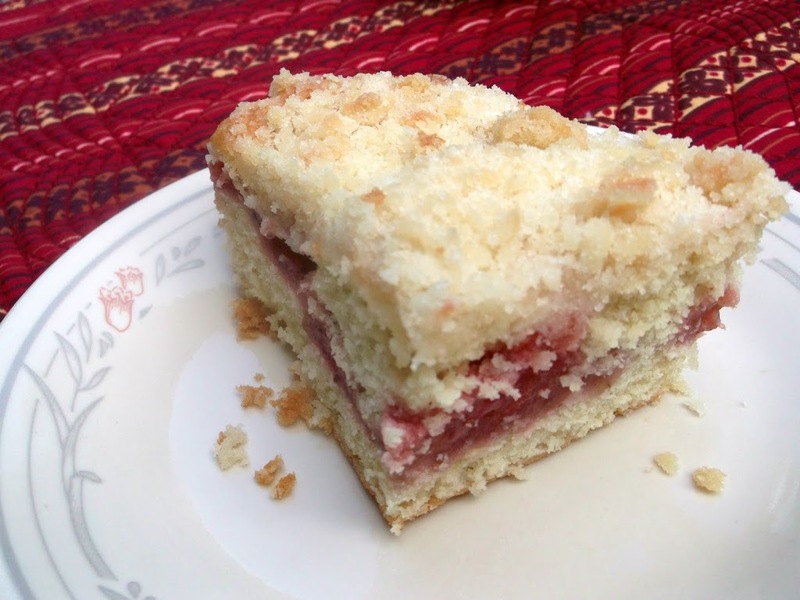 We love coffee cake in our house and I thought the strawberry would help make the rhubarb not quite as sour. So I made it for a Sunday morning a couple of weeks ago. Everyone enjoyed it. Later on when my son Adam was eating a piece I mentioned that I was going to freeze some of the rhubarb so that I could make this later in the year. He was surprised that the coffee cake had rhubarb in it, because he is one of my kids that doesn’t usually eat rhubarb. This coffee cake is nice and moist and full of flavor. The tartness of the rhubarb and the sweetness of the strawberries combination will make this coffee cake one that you will want to make over and over again. And who knows even if you don’t like rhubarb you may be like my Adam and discover that rhubarb isn’t so bad after all. In a saucepan, combine sugar and cornstarch; stir in rhubarb and strawberries. Bring to a boil over medium heat; cook for 2 minutes or until thickened. Remove from the heat; stir in lemon juice. Cool. In a large bowl, combine flour, sugar, baking powder, baking soda, and salt. Cut in butter until mixture is crumbly. In another bowl, beat the eggs, buttermilk, and vanilla; stir in crumb mixture just until moistened. Spoon two-thirds of the batter into a greased 13 x 9 inch baking dish. Spoon cooled filling over batter. Top filling with the remaining batter. For topping, combine sugar and flour in a small bowl; cut in butter until mixture is crumbly, sprinkle over batter. Bake at 350 degree F for 45-50 minutes or until a toothpick inserted near the center comes out clean and the cake is golden brown. Cool on a wire rack. Note: Frozen berries can be used instead of the fresh berries. If using frozen use one package (10 ounces) frozen sweetened sliced berries. If using the frozen sweetened berries reduce the sugar to 2/3 cup for the sauce. I really wish I had a slice of this right now to go with my coffee. YUM! I have never had rhubarb before…your coffee cake sounds terrific. My rhubarb crop is usually pretty sad, but I did notice a few pickable stalks. I know I’d love your yummy coffee cake! 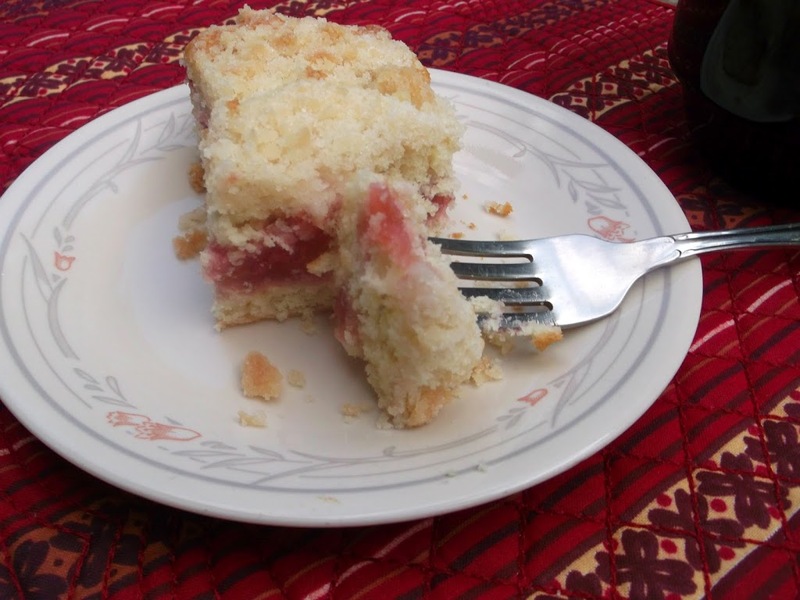 I envy you your fresh from the garden rhubarb… The cake look delicious! I love pairing rhubarb with strawberries – yum! This looks super yummy. I love coffee cakes and I bet this goes great with a cup. What a lovely cake! I need to grow some rhubarb! It’s so pricey and disappears fast from the markets here.